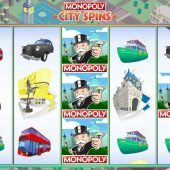 Monopoly City Spins slot is another Gamesys Hasbro-licensed slot and sits alongside their Battleship Wild Targets and Monopoly Rising Riches games. As you may be aware, WMS have also used this with their Super Monopoly Money slot and a few others of less renown. You will immediately wonder how Monopoly City Spins compares with these, being from a lesser-known developer. I can happily say you won't be disappointed as the the base game and especially the bonus are quite superb as we will soon discover! The standard 5x3 screen has 25 pay lines at a cost of 30 coins and the icons are based on urban sights such as buildings, tube trains, buses and taxis along with the annoying bicycles. The city in question appears to be London and you will see the Millennium Dome in the game's landscape background along with other iconic landmarks. Will this slot waste as much of your money as that Dome did? There are single and double symbols on all reels bar the stacked Wilds formed of the game's logo which is good as these pay a whopping (or should I say 'Wapping') 5000 coins or 166.6x stake for 5-of-a-kind, the Cases of Gold pay 33.33x and the lowest symbol the Thames Boat pays 2.5x for 5. So you could get to be the banker here if those Wilds line up! As for sound, we get the usual jazzy big band musical soundtrack and some sound effects when the reels stop. Old Kent Road for example awards 1 free spin with a random multiplier 5x to 15x. Positions after it do the same but offer either 2, 3 or 4 spins. 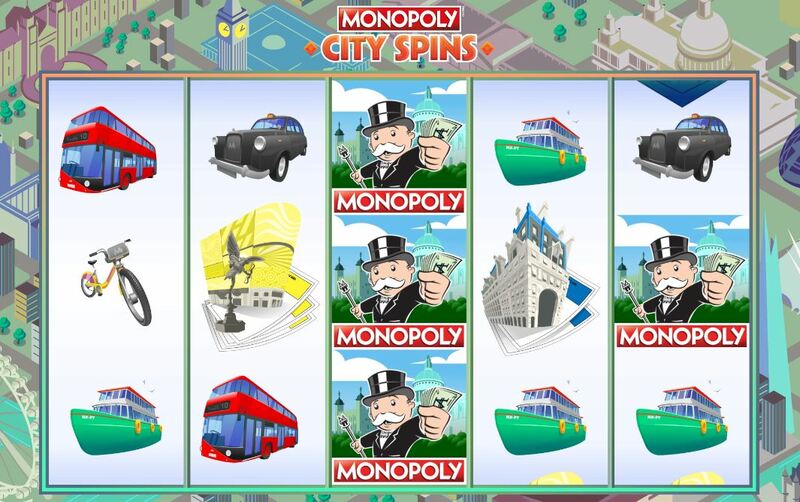 Starting at Northumberland Avenue you get 2 spins this time with random Wilds (at least) 3 added to the screen, and positions after it do the same but with 3 or 4 free spins. Fleet Street awards 1 spin with 3 moving Wilds which means 3 are added to the screen and find a pattern to settle in as the reels spin and the positions after do the same up to 4 spins with moving Wilds. Oxford Street awards 1 spin with Wild reels, between 1 and 5 reels turn Wild and then along to Mayfair which awards 4 of these spins. Stations award a cash award with a train filling with more passengers for more cash and the Electricity Utility does the same with lighting up properties and Waterworks does similar by choosing a valve to open and money comes out until it closes. Phew! Many of these properties will also award an extra throw as will Passing Go and naturally Chance and Community Chest will be benevolent, usually 2 or more extra throws and of course landing on 'Just Passing Jail' will award a Get Out Of Jail token in case you land there and your game ends. When you run out of throws you proceed to some different reels in a gold colour. You can get expanding Mr. Monopoly Wilds too on these and you go through your free spins in the order they were earned, i.e. starting at Old Kent road which would have been the spins with random 5-15x multipliers. So the potential for 5 Wilds at 15x is good, but the Wilds only pay 1/10 of the 5000 coins in the base game! Once all the free games types accumulated have been played, you are paid the total.